New Orleans Suspects & Friends, featuring JoJo Hermann (Widespread Panic) will perform at State Bridge Lodge near Vail and Beaver Creek on Saturday, July 4. Special guests include: Duane Trucks (Widespread Panic), Col Bruce Hampton (Aquarium Rescue Unit), DJ Logic, Chris Stillwell (Karl Denson’s Tiny Universe), Big Chief Juan Pardo (Golden Commanches), Chadzilla (Polytoxic), Todd Smallie (Mofro) and more tba. Doors open both nights at 10:00 P.M. These shows are open to patrons 16 and over. Tickets are $20.00 in advance and $25.00 day of show. For more information click here. Friday, July 3rd @ 5:00 P.M.
Saturday, July 4th @ 8:00 P.M.
Thursday, August 6th @ 5:30 P.M.-7:30 P.M.
Saturday, August 8th @ 6:30 P.M.-8:00 P.M.
New Orleans Suspects is comprised of some of the best, most highly respected players in New Orleans including: Reggie Scanlan on bass (The Radiators, Professor Longhair Band); “Mean” Willie Green on drums (Neville Bros.); Jeff Watkins on saxophone (James Brown Band, Joss Stone Band); Jake Eckert on guitar/vocals (Dirty Dozen Brass Band); and CR Gruver on keyboards and vocals (Polytoxic, Outformation). Ouroboros is the band’s third recording and the follow up to their 2012 live CD, Caught Live At The Maple Leaf. 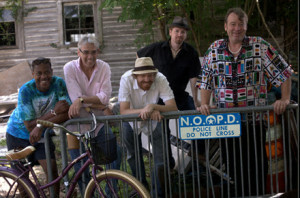 Released in October 2014 on Louisiana Red Hot Records, Ouroboros features 10 original songs that define the band’s sound, which is one that puts their own twist on the traditions of New Orleans music–fever-inducing funk, irresistible R&B rhythms, Longhair rhumbas, dancing-in-the-street second lines, jazzy soul-drenched horns, mind-melting swamp hoodoo, and feet-don’t-fail-me-now Carnivale music– that takes the listener on a wild ride through the city’s musical history in a brand new vehicle. The title of the recording was carefully chosen by the band. The Ouroboros is a powerful symbol–an ancient circular icon of a serpent eating its own tail–that symbolizes cyclicality and things that begin anew as soon as they end. The band recently performed on the Midday News on WGN in Chicago. Click here to see the performance.